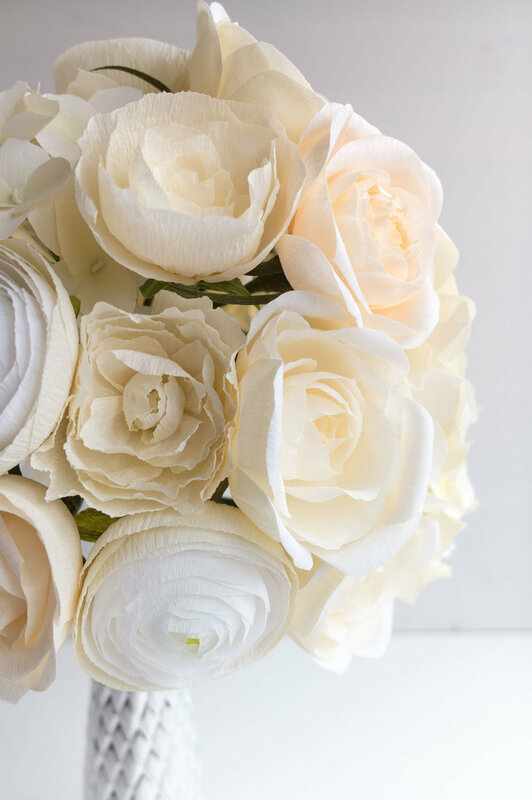 Jay & Kelly's Monochromatic Paperversary — Paper Rose Co. So when Jay reached out to have me help him with his first-anniversary gift, I jumped at the opportunity. The photos he sent were not only stunning, but they caught my attention because of what they lacked. Color! Now, walk into any hardware store, and you'll know there are approximately 9,871,412 shades of white. (At least according to my husband, and the paint swatches I brought home when deciding which one to use in our house.) 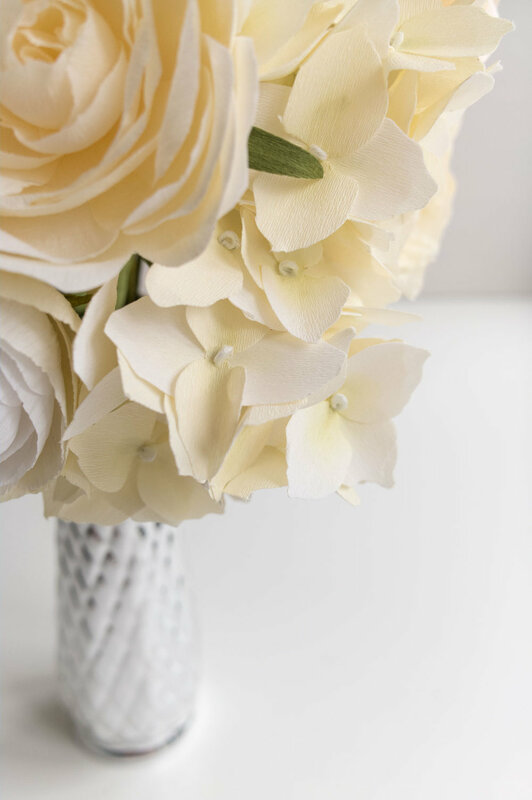 So technically there is color in this bouquet, but compared to what I'm used to working with, the minimalistic qualities of this piece were a refreshing change of pace. 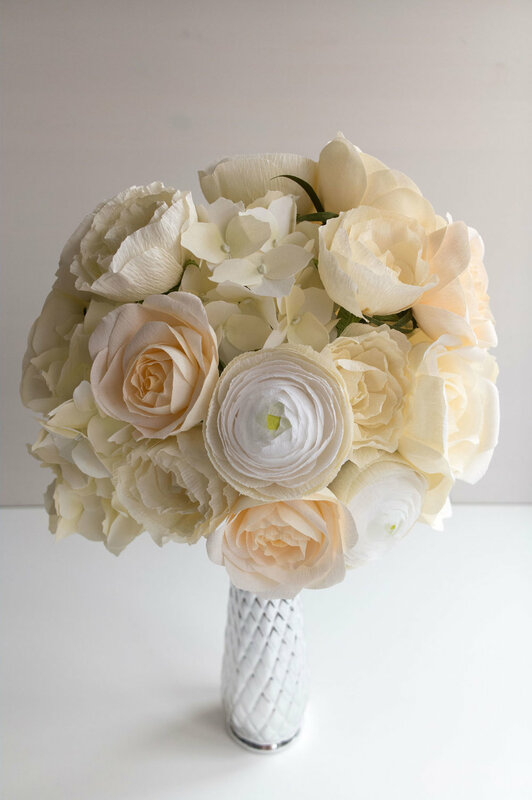 Eliminating the challenge of matching and creating hues (something I spend a lot of time doing with custom orders), I was able to focus on other nuances, like texture, proportion, and the layering of many, many blooms into a tightly woven bouquet. 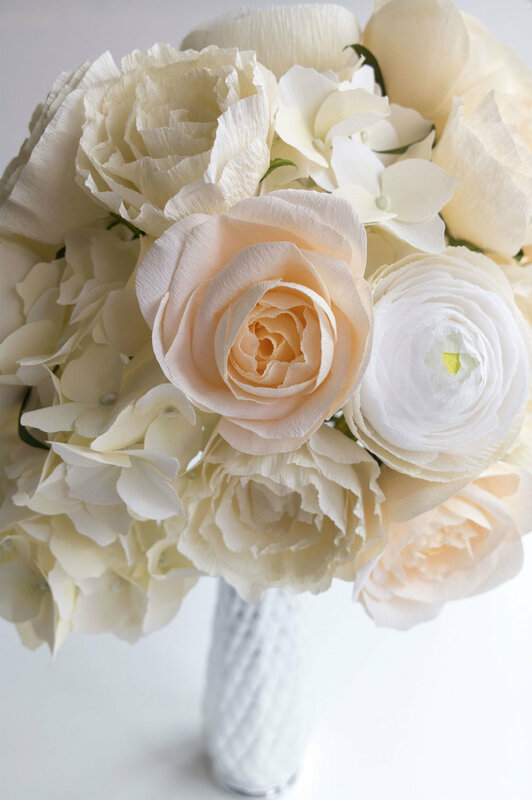 Individually, these stems of hydrangea, garden roses, and ranunculus seemed simple. But together the results are magnificent and elegant. I love this arrangement so much, and I don't even feel the urge to throw in another color. Or 6. And from what I was told, Kelly agreed. Now she can enjoy a version of her beautiful choice in florals for many years to come. Mission accomplished! Keep an eye out next week for more Paperversary reveals. I have a whole backlog of anniversaries to help celebrate and lots and lots of excellent spring flowers to share. Until then, have a great weekend!